Innovated from a revolutionary NASA coating, Lexus ProTect will preserve the immaculate finish of your car's paintwork, upholstery and alloy wheels. Just one application at Lexus Twickenham gives you five years peace of mind. 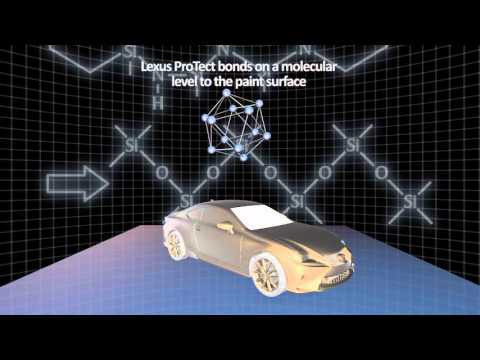 Innovative - Lexus ProTect is an entirely new technology. it works at a molecular level to bond with the existing surface and create an extremely tough, durable seal. Protective - Lexus ProTect's ceramic hardened finish guards against traffic film, pollution, the weather, acid rain, solvents and much more. Its hydro-repellent qualities help keep your car looking fresher for longer. Guaranteed - Just one application of Lexus ProTect gives you guaranteed paintwork protection for five years. No monthly conservers are required. If you change your car within that time, the guarantee passes to the new owner. Versatile - Lexus ProTect is ideal for protecting the showroom appearance of a new Lexus and also for revitalising an older car. Special treatments are available for paintwork, alloy wheels and upholstery. Easy - Once your car has been treated with Lexus ProTect you can wash it as normal with a regular wax-free shampoo. The surface finish is highly durable and there's no need to wax or polish. Valuable - Lexus ProTect is a sound investment. It helps maintain the best possible appearance and so contributes to enhancing you car's part-exchange or sale value. Advanced - Lexus ProTect provides greater protection and longer durability than advanced polymer sealants and traditional wax coatings. Lexus ProTect seals the exterior of your car with a ceramic hardened finish that guards paintwork and side windows against the effects of pollution, weather, solvents and many other threats. The Lexus ProTect system includes a hypoallergenic fabric protector which can be safely applied to interior cloth upholstery, including carpet mats and trunk floor mat. Everyday spills, dirt and grime will wipe off without leaving a stain. Alloy wheels keep their appeal better with Lexus ProTect. Unsightly marks and grime caused by brake dust, road conditions and the weather are easy to clean away during normal washing.